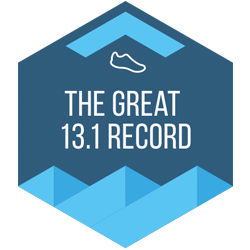 To celebrate the Simplyhealth Great North Run on September 10th, be part of a global attempt to set the record for the most half marathons completed in one day. It doesn’t matter where in the world you run, just put on your favourite running shoes and join us to make history. Join us on September 10th to set the world record for the most half marathons run in a single day. We’re partnering with the SimplyHealth Great North Run, the world’s largest 13.1, to kick things off that morning. Then Strava runners from around the world will keep it going all day. It doesn’t matter where you are or how fast you go – join us on the 10th and make history. All winners will be part of the World Record attempt and receive an exclusive digital finishers badge! All activities must be logged during the Challenge period and uploaded to Strava within three days of the Challenge ending. Manual entries, treadmill runs, bike rides, activities in motorised vehicles, or runs marked 'Private' will not count towards your Challenge effort. By participating in the Challenge, you agree to indemnify Strava, The Great Run Company and its representatives, including any officers, directors, employees and agents, successors, harmless from and against any and all liabilities, claims, suits, damages, judgments, costs and expenses, including reasonable attorney’s fees arising out of or in connection with any loss, damage, or injury suffered during your participation in the Challenge.